Torino stopped the rot after three consecutive defeats with a hard-fought 1-0 win over Genoa on Thursday evening. Leandro Castan and Iago Falque returned to the starting eleven after losing their places for the defeat at Napoli, however it was the away side who made the better start. Joe Hart had to make good saves to deny Nikola Ninkovic and then Isaac Cofie in quick succession, although Adem Ljajic also went close for Toro at the other end. Toro took the lead four minutes into the second half when Adem Ljajic's excellent free kick was stabbed home by Andrea Belotti, his 13th league goal of the season. Belotti was a constant threat to the Genoa defence in the second half and was only denied a second goal due to a great save from Eugenio Lamanna. Genoa made history in the dying moments as they bought on fifteen year old Pietro Pellegri in search of an equaliser. Pellegri is now the youngest player to ever appear in Serie A, but he didn't even touch the ball as Toro held on for three crucial points. 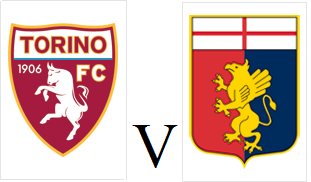 Torino will look to end the year in style when they face Genoa at the Stadio Grande Torino on Thursday evening. After three successive defeats Toro are not in great form, but the performance against Juventus and second half display at Napoli is something to build on. Sinisa Mihajlovic has voiced his anger at Adem Ljajic's recent performances, so Josef Martinez or Lucas Boyé could be in line to replace the Serbian winger. Genoa are two points below Torino in 12th place and have won two of their last five games, but suffered a surprise 4-3 home defeat to Palermo last time out. Torino fell to a third consecutive defeat as Dries Mertens scored a nine minute hat trick in a 5-3 loss to Napoli on Sunday afternoon. Sinisa Mihajlovic changed his favoured starting eleven with Emiliano Moretti coming in to replace Leandro Castan and Davide Zappacosta replacing Iago Falque. However, Toro made a terrible start and were behind after only thirteen minutes as they fell asleep at a corner and that allowed Dries Mertens to convert Jose Callejon's low cross. Five minutes later Mertens was brought down in the area by Antonio Barreca, and the Belgian stepped up himself to send Joe Hart the wrong way and double Napoli's lead. The former PSV man then completed his hat trick at the second attempt after initially being denied by a Luca Rossettini clearance. Toro had a lifeline on the hour mark when Andrea Belotti stabbed home from close range, but Napoli's three goal lead was re-established when Vlad Chiriches finished off an excellent team move. However, six minutes later an error from Pepe Reina allowed Rossettini to score his first goal for Torino. But this match was the Dries Mertens show, and he scored his fourth goal of the game - a sensational chip over Joe Hart who was only inches off his line. There was still time for Toro to score a third goal, as Iago Falque scored a penalty after being pushed in the area by Jose Callejon. However, despite scoring three goals at the San Paolo, this was a night to forget for Torino. 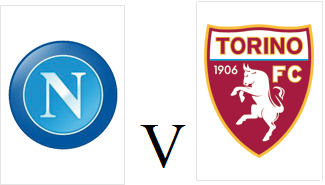 Torino will be looking to avoid a third consecutive league defeat when they travel to 4th place Napoli on Sunday afternoon. Toro impressed for large spells in last week's derby against Juventus and were unlucky to lose, but need to improve on their away form as they have only won two away games all season. Napoli are unbeaten in their last five league games and Serbian defender Nikola Maksimovic could face his former team after leaving Toro in the Summer. Torino took an early lead in the Derby Della Mole but conceded two late goals as they succumbed to another defeat against Juventus. There was a controversial moment in the opening stages as Andrea Belotti was pulled back by last man Daniele Rugani, but the referee waved play on. However, Toro took the lead on sixteen minutes when Daniele Baselli's cut back was expertly headed home by Andrea Belotti. Unfortunately that lead did not last long as twelve minutes later the Granata were punished when Adem Ljajic lost possession on the half-way line and seconds later Gonzalo Higuain finished well past Joe Hart. Torino were creating the better chances in the second half and Adem Ljajic came narrowly close to making amends for his earlier error, but his curling shot went just wide of the post. With ten minutes remaining Sinisa Mihajlovic made a treble change as he went in search of a winner, with strikers Josef Martinez and Lucas Boyé entering the field. However, when play restarted, Juventus immediately took the lead when Gonzalo Higuain out muscled Antonio Barreca before volleying past Hart. Juve scored another goal in the dying seconds as despite making excellent saves from Higuain and then Miralem Pjanic, Hart was unable to deny the Bosnian for a second time as he added a third . This meant the final scoreline was unfair on Toro who had matched the Champions for eighty minutes, and had their chances to take the lead earlier in the game. 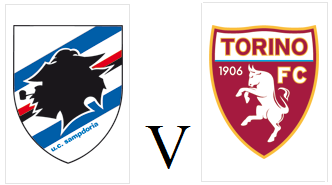 Torino head into Sunday's 235th Derby Della Mole in optimistic fashion despite suffering defeat against Sampdoria in their last fixture. The Granata are unbeaten at home this season, winning five of their seven fixtures so far with attacking trident Adem Ljajic, Andrea Belotti and Iago Falque weighing in with an impressive tally of twenty-two goals already this season. Toro have no injuries ahead of the derby, so Sinisa Mihajlovic may choose to stick with the eleven who were slightly unfortunate in defeat against Samp last Sunday. However, Toro once again conceded from a set piece in that game, and this is a recurring problem which the Granata must deal with ahead of Juve's visit. 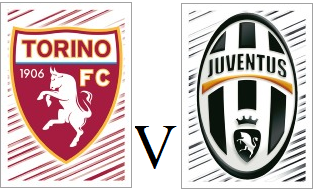 Juventus are four points clear at the top of the Serie A table and completed the double (and a cup victory) over Toro last season - however, they have already suffered three away defeats this season, which will give Torino heart. As will the fact the bianconeri will be without key defenders Andrea Barzagli and Leonardo Bonucci. Torino lost their first game since late October as they fell to a 2-0 defeat against Sampdoria on Sunday afternoon. Toro made a bright start as Iago Falque hit the bar in the early stages, whilst Adem Ljajic's free kick forced a save out of Christian Puggioni. Puggioni made another save to deny Andrea Belotti at the start of the second half, and Toro were then made to pay for their missed chances. Once again it was a set piece that caused the Toro defence problems, and that allowed Edgar Barreto to swivel and stab the ball into the far corner. Toro went in search of an equaliser, and Belotti was once again denied by Puggioni and substitute Maxi Lopez saw a goal narrowly disallowed for offside. In the dying seconds, Toro were dealt a sucker punch as Czech striker Patrick Schick fired through Joe Hart's legs to seal all three points for Samp. Torino will look to celebrate their birthday in style when they face Sinisa Mihajlovic's former team Sampdoria on Sunday afternoon. The Granata were formed 110 years ago on December 3rd 1906, and Mihajlovic has expressed his desire for the team to put on a performance to commemorate the occasion with three points. Sampdoria are in decent form and are unbeaten in their four games and have won their last three home games. Former Toro striker Fabio Quagliarella has scored four goals this season for Samp, and is sure to get a lively reception from the away fans due to the controversial way his Toro career ended. Torino progressed to the last sixteen of the Coppa Italia with a 4-0 victory over Pisa, but Toro needed extra time to get past the Serie B side. As expected, Sinisa Mihajlovic made eleven changes from the side who beat Chievo, with Arlind Arjeti, Sasa Lukic and Maxi Lopez amongst those given rare starts. It was the Ghanaian midfielder Acquah who had Toro's best chance in the first half, but he was denied by an excellent save from Samir Ujkani. The Granata were finding it tough to break down Gennaro Gattuso's men, and bought on Adem Ljajic in an effort to find a goal. However, it was the Tuscan side who came closest to opening the scoring, but Daniele Padelli made a stunning save to deny Andrea Lisuzzo. Pisa were reduced to ten men when Andrea Lazzari couldn't continue due to injury, and the away side had already made all three changes. Maxi Lopez smashed a shot of the crossbar in the dying moments, but Toro still couldn't find a break through so the game went into extra time. The Granata needed only two minutes to find that all important goal, as Adem Ljajic fired a shot past Ujkani from just outside the area. The floodgates then opened in the second half of extra time, as Maxi Lopez, Lucas Boyé and Andrea Belotti added there name to the score sheet and Toro secured a tie with AC Milan in the next round.